When it comes to making a move to Cheyenne, Wyoming, it just makes sense to turn to a real estate professional who cares about your needs and will go the extra mile to meet them. As a real estate professional, Jeremy has made it his passion to know everything he can about relocating to, from or within the Cheyenne area. Those who have worked with Jeremy, appreciate knowing the purchase of their new home is in the hands of such a capable and trustworthy real estate agent. 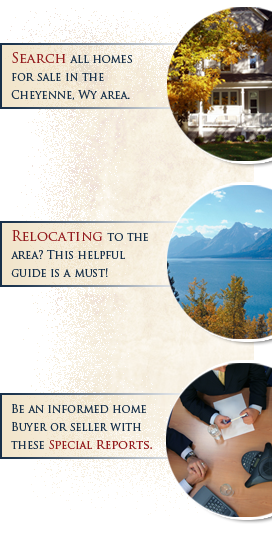 To order the following complimentary relocation guide, just check the box to the left of the title and click "Send Me" at the bottom. You will then be prompted to enter your mailing information. Jeremy will mail you the Cheyenne guide shortly after receiving your request. Referral listings of Jeremy's hand-selected and highly recommended team of local professionals, including loan officers, accountants, lawyers, decorators, remodeling and construction companies, financial planners, house cleaners, landscapers and more. A current copy of the Wyoming Tribune Eagle, so you can read up on all the latest news in your new home town.